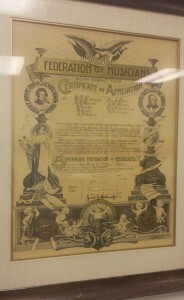 On March 15, 1897, Local 47’s charter and affiliation was approved by the American Federation of Musicians. This monumental day marked the end of a long struggle musicians in Los Angeles who tried, then failed, and ultimately succeeded succeeded in effectively organizing with the union we belong to today. 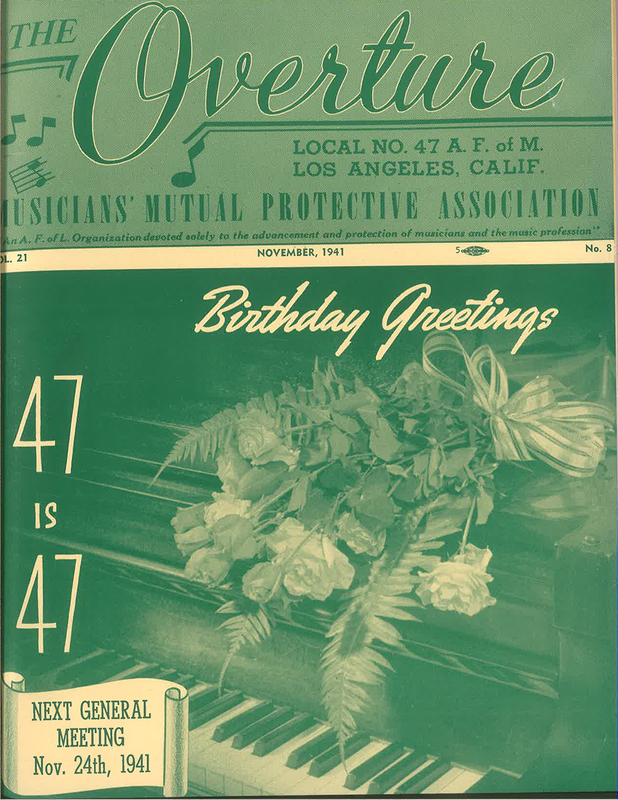 The first attempt to form a local of musicians in L.A. was made in 1888, when on April 1 the Los Angeles Musical Protective Association was founded. 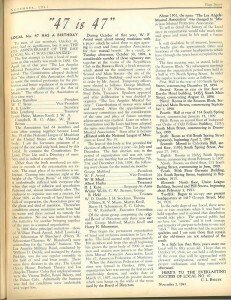 The Constitution adopted declared that “the object of this Association shall be to unite the musical profession for the protection and better regulation of its members, to promote the cultivation of the Art of Music.” The Association had 64 members and soon after coming together became Local No. 19 of the National League of Musicians of the United States—then the National body. But, coming into existence right at the height of the “Great Boom” of 1885-1888, the endeavor to organize was not a success, and in 1891 the organization died of inanition. Thereafter conditions among musicians went from bad to worse and there seemed no remedy for the situation. In 1894, three principal orchestras—those of William Frank Arend, Adolf Lowinsky, and Schoneman & Blanchard (Harry H. Schoneman-Clarence W. Blanchard)—were contending for the “outside” business. The Los Angeles Military Band conducted by William D. Deeble was the one regular ensemble in the field of reed and brass music. There were three theaters in the city: the Grand Opera House, Burbank Theater, and Los Angeles Theater. Cafes that employed music were the Vienna Buffet, Royal Bakery, and the Palace Café. Admittedly the business was bad, for conditions were undesirable and wages low. During October of that year, Arend went among musicians with a paper which he asked them to sign agreeing to meet and form another Association for their mutual benefit. 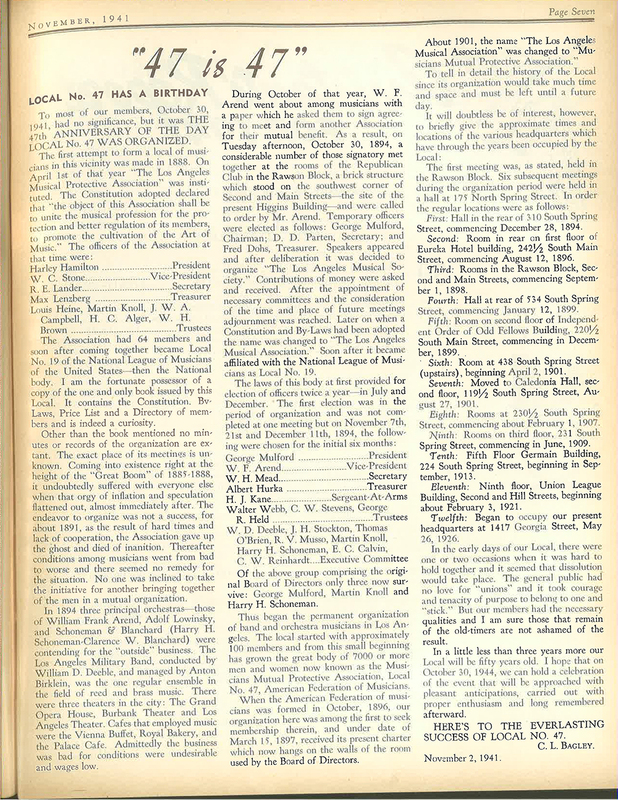 As a result, on Tuesday afternoon, Oct. 30, 1894, a considerable number of those signatory met together at the rooms of the Republican Club in the Rawson Block, a brick structure which stood on the southwest corner of Second and Main Streets. After deliberation it was decided to call the new organization the Los Angeles Musical Society. After a constitution and bylaws had been adopted, the name was changed to the Los Angeles Musical Association. Soon after it became affiliated with the National League of Musicians as Local No. 19. Thus began the permanent organization of band and orchestra musicians in Los Angeles. The local started with approximately 100 members and from this small beginning has grown the great body of over 7,000 women and men of AFM Local 47. 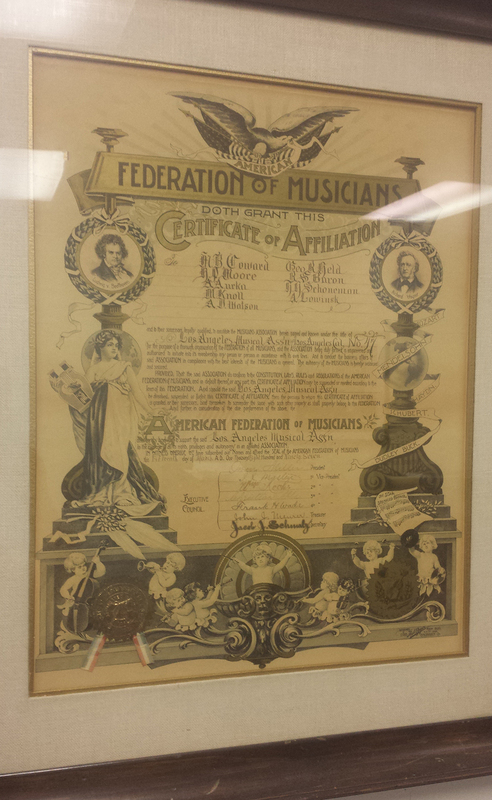 When the American Federation of Musicians was formed in October 1896, our organization here was among the first to seek membership therein, and under date of March 15, 1897, received its present charter which now hangs on the walls of our Local.